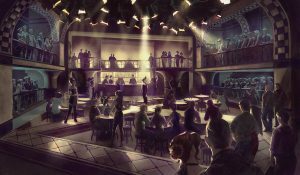 As the Ringmaster begins the evening’s revels with the song, “ Come Out And Play“, the audience finds that they are already a part of the show. Actors and actions surround them; at the bar, the dance-floor, on raised platforms and catwalks, with video closeups broadcast to large screens throughout the space. Our characters challenge traditional expectations, both in sexuality and gender. At the discretion of the company (and perhaps even the audience, through pre-show surveys), each performance of Mythos will be cast in a distinctive manner. A female vampire may seduce a female human for one audience; a male vampire may seduce a male human for the next; another audience may witness hetero-normative relationships playing out. Dramatic power struggles develop very differently when a female is the seducer rather than the seduced. The character of the Deity, when played at a particular performance by a gender-fluid performer, will offer audiences the opportunity to view theatre through a nonstandard lens. The Mythos cast will reflect all forms of diversity: ethnicity, gender, age and body-type. Through diverse casting and fluid character portrayals, the play will challenge traditional expectations of attraction and desire. This playlist features selections from several songs performed at NYMF in 2018, across three nights with three different role assignments. 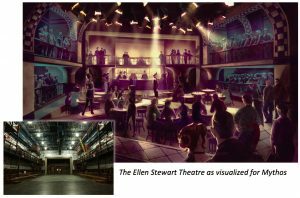 The next stage of development for MYTHOS is a fully-realized staged production in an alternative flexible performance space like the Ellen Stewart Theatre. MYTHOS will be a singular experience: visceral, emotional, and entertaining. To join our team, or post any questions or comments, please contact us at [email protected].